A detail from a page of "Depero Futurista"
Depero Futurista, a rare 1927 art book by the Italian Futurist Fortunato Depero has been successfully reprinted in a near-perfect facsimile edition thanks to the efforts of Raffaele Bedarida, assistant professor in the Faculty of Humanities and Social Sciences. A year ago he established a Kickstarter campaign to fund the reproduction of the work, which is known as the Bolted Book thanks to its unique binding of two nuts and bolts that hold together the pages. 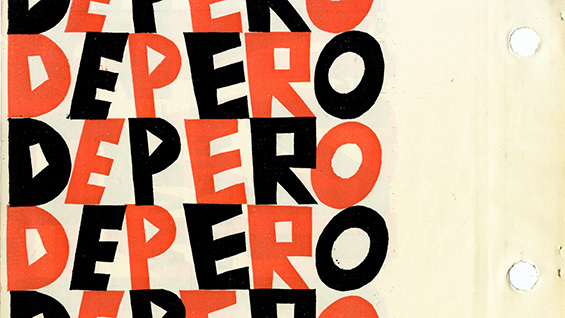 The contents are manifestos and artworks by Depero, who designed the book to be deconstructed and used as a portable museum of his works. It is considered by some to be the first example of an artist's book, but unquestionably stands as a major work of graphic design. To celebrate the publication, which was co-edited by Professor Bedarida, along with Steven Heller and Heather Ewing, the three of them will be giving a talk at the newly renovated Artbook bookstore at MoMA PS1 on Sunday, September 24th at 1 p.m. as part of the New York Art Book Fair.